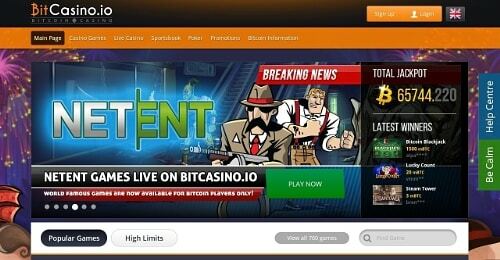 Net Entertainment (NetEnt) games are now available at BitCasino.io, the first licensed and regulated bitcoin online gambling site in the world. This may not be breaking news to our readers as we wrote about it in June, but now the games have officially launched and brought the Bitcasino portfolio up to a total of more than 750 high quality Bitcoin casino games. 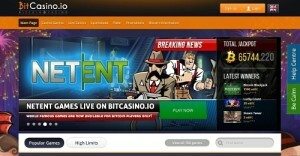 >> Play Netent casino games with bitcoins here. BitCasino.io has integrated NetEnt’s portfolio of games into its catalog of game offerings. As a result, players can choose from over 150 online casino games and over 30 mobile casino games. Some of the hottest NetEnt titles now available in the BitCasino.io lobby are Gonzo’s Quest, Blood Suckers, and South Park, and these titles are also available for play on smartphones and tablets. Unfortunately, residents of Belgium, Denmark, Canada, Gibraltar, France, Guernsey, Gibraltar, Italy, Isle of Man, Spain, United Kingdom, and United States cannot access the NetEnt games in BitCasino.io’s portfolio. BitCasino.io is owned and operated by Kopikas Enterprises, which has received a license to offer online bitcoin gambling services in Montenegro. The portfolio of games at BitCasino.io contains over 750 online casino games such as live dealer casino games, baccarat, blackjack, dice, and lotto games. Most of the games are written in HTML5, which means that they can be played directly from the browser on smartphones and tablets. In addition, the games at BitCasino.io come with high bet limits, which makes them ideal for casino high rollers. BitCasino.io employs highly qualified, well-trained, and courteous customer care representatives who provide 24/7 customer support services to more than 100,000 players from over 80 countries across the world. BitCasino.io is home to a load of bonuses and rewards for loyalty. New players can claim a first deposit bonus of 100% up to 1 BTC, a second deposit bonus of 50% up to 500 mBTC, and reload bonuses of 25% on all their future deposits. NetEnt games have become available to bitcoin players because of the partnership deal signed between Coingaming.io, the prominent provider of bitcoin online gambling software solutions, and NetEnt. This deal has made Coingaming.io the first provider of online bitcoin gambling services to integrate NetEnt’s portfolio into its gaming platform. Commenting on the agreement between the two companies, Coingaming Communications Director Mark McGuinness said that his company is delighted to get the opportunity to deliver NetEnt games to “NetEnt’s approved white list countries via our platform.” Referring to NetEnt as among “the leading providers of digitally distributed casino systems and games used by many of the industry’s most successful operators,” he said that its B2B partner BitCasino.io will be the first to offer NetEnt’s gaming portfolio to bitcoin players.